As more clients are installing calving gates on their farms we thought it might be useful to share our thoughts on them…. QUICK-RELEASE YOKE – a yoke allows one person to safely and quickly calve a cow but it is vital it is a quick release design as a cow will choke to death within minutes if she becomes trapped in a yoke. RUMP CHAIN – most setups have a chain that attaches behind the cow’s rump. It is a good idea to include some baler twine where the chain attaches to another gate / steel ring. If the cow goes down or sits on the chain, this can be easily cut. 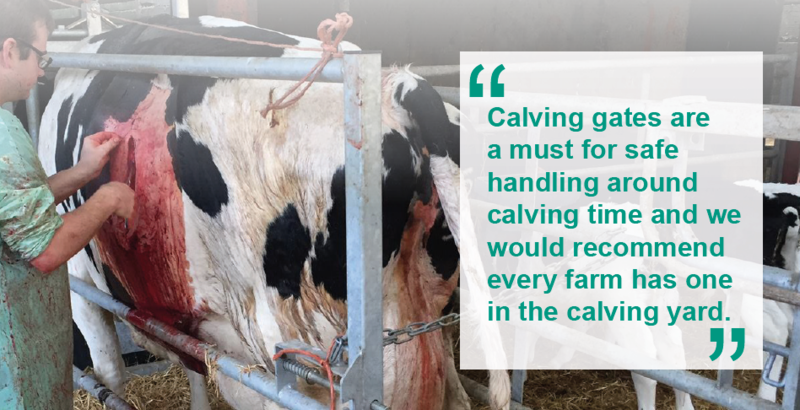 POSITIONING – make sure there is enough room behind the cow to use a long calving jack. In addition, positioning the calving gate against another gate rather than a wall facilitates easier use of the calving jack. CAESAREANS – most calving gates allow good access for the vet if a caesarean is needed, through either a separate smaller caesarean gate or using removable bars. We are big fans of these! CALF ACCESS – the gate needs to be hung high enough to allow a calf to suckle even when there is a build-up of straw. Some gates are slanted at the bottom to facilitate calf access, others have a separate section that opens for this purpose.